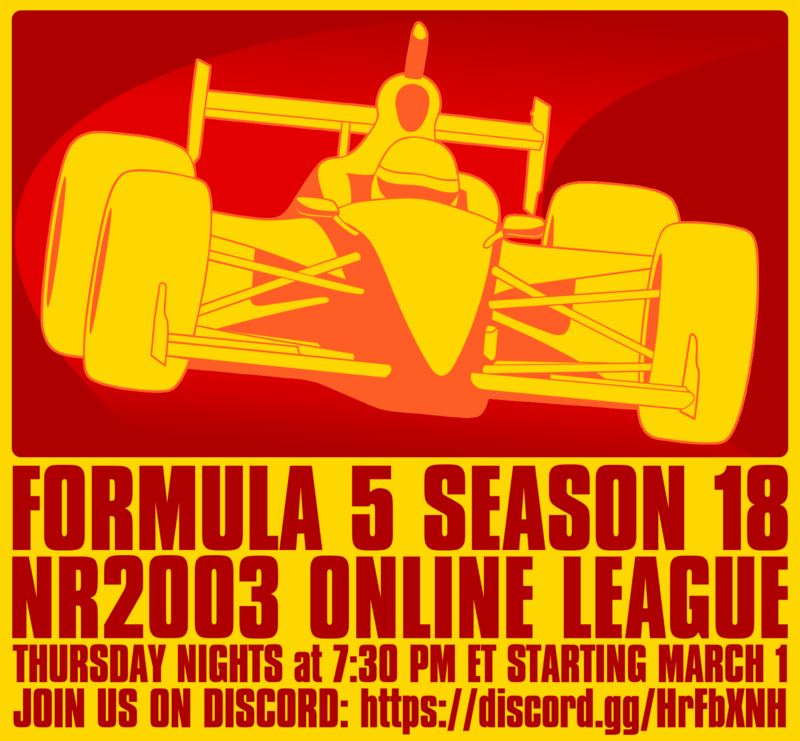 Formula 5 is a long-running online league, hosted by open-wheel enthusiasts, for open-wheel enthusiasts. Starting March 1st, Formula 5 will be starting its eighteenth season of racing (we've been doing this since 2009)! We'll run every Thursday night, with practice starting at 7:30 ET. We use the IndyCar V1.1 mod in .pta physics, on mostly road courses and short ovals. -We run with a hacked .exe that makes the cars lighter, gives them more torque, and expands the garage settings. The cars drive something similar to how Champ Cars would drive in the late-90's. We also run with open setups. Your setups for vanilla NR will work, but you will probably want to tighten them up a fair bit. -We also run with AI cars, or "bots". The reason for having bots is to give the player a goal to beat, so if you show up and you can at least outrun a few bots, you're probably in good shape for the race. The Top 10 in driver's points at the end of the season are allowed (but not required) to enter their own bot for the following season. -Drivers of all backgrounds, talents, and experience levels are allowed. We're all doing this for fun in our leisure time, so we don't take ourselves as seriously as certain other leagues. If you show up and make a fool of yourself, you probably won't make too many people happy, but it's better that you do it here than somewhere else (this isn't an invitation to deliberately make a fool of yourself. We have rules and we enforce them). Everything you'll need to come run with us can be found on our Discord server. We do have a list of claimed numbers, so you'll want to check the #online_league_stuff channel to make sure the number you want isn't taken. We look forward to having some new people race with us! Reminder that this is starting today. Our first race of the season will be at Burlington. Come and join us! Congrats to Matt Contey winning and getting 5/6ths of a win! We just had a legendary race at Gravis City Zone 11 tonight. Video coming at some point, either from me or somebody else. This race deserves it either way. All I can say is that it ended in a stupider version of Wickens vs. Rossi for the last podium position. Congrats to John Poole III for whacking the field in his first run with us! We've been impressed by the car counts for the three races we've run so far. Rounding together fifteen people for an NR race in 2018 is a difficult thing to do. Okay actually screw the Gravis City race. This tops it. Posting this on Mike's behalf. This is what y'all have been missing all season. More or less. The last race we ran was at John Norton's new track Arena Café Norte, where yours truly clinched the Season 18 championship with two races left! This race amassed a total of sixteen people, a record turnout for this season! The last two races of the season will be at Iowa and Gravis City Zone 7, so be sure to come out for those two and we'll see if we can't break that record. After the Formula 5 season ends, another season of Short Oval Challenge will follow, most likely run with the new Pinty's mod from SNG. That should start about a month after Formula 5 ends. With the turnouts we've been getting, it should be fun! The Formula 5 season ended last Thursday with Vincenzo Fochesato (SpeedDemon37) taking home the victory in the season finale at Gravis City Zone 7! As previously mentioned, yours truly clinched the title with two races left, and after a short offseason, we'll be back with another season of Short Oval Challenge. [Here] you can download a full rated carset for Season 18, for the IndyCar Racing V1.1 mod. In addition to the standard ratings package I use, I've included also a second set with an experimental ratings package formulated by me. That ratings package is more tailored towards online racing specifically; it gives more of an advantage to cars that won races and led a lot of laps, not just cars that finished well. I've also archived the race replays from every race this season, which you can download separately [here]. Track links are included in the .txt files that come with each download. Credit to Vincenzo for lending me the replays for the two races I missed this season, Castle Gorge and Karjala. -A total of 33 human drivers made appearances in 21 races this season (enough to fill an Indy 500 grid!). 29 of them scored points. -An average of thirteen human drivers showed up for each race. -Eleven humans won races. Matthew Contey won the most with five wins. -Sixteen humans led laps. Jacob Eichholtz led the most, at 229. -Ben Atkins has the highest laps led to laps completed ratio, leading 75% of the laps he completed. -John Poole III achieved the highest average finish of any driver -- an average finish of 2.1 for his eight races. -A total of 10,138 race laps were turned by all human drivers. Daniel Leckliter completed the most laps of any driver, with a total of 944. -Ryan Bugaj DNF'd eleven races, the most of any driver. -The longest race distance-wise was Road America, at a length of 97.15 miles. The shortest race distance-wise was Burlington, at a length of 54.60 miles. -The longest race time-wise was Loudon, with a duration of 44:59. The shortest race time-wise Edmonton 2006, with a duration of 26:38. -Formula 5 races for this season had an average distance of 73.54 miles, and an average duration of 35:04. -The fastest race average speed was set by Matthew Contey at Inferno Pool, with a speed of 152.950 mph. -The slowest race average speed was set by Ben Atkins at Arena Cafe Norte, with a speed of 91.935 mph. gone-sovereign wrote: I've also archived the race replays from every race this season, which you can download separately [here]. Track links are included in the .txt files that come with each download. Credit to Vincenzo for lending me the replays for the two races I missed this season, Castle Gorge and Karjala. This season was an all-around blast! Really happy to have seen so many people show up and race, it made for some great fun! And once more I owe all of you a big thanks for egging me to start racing with you a couple of years ago. I never expected that I would ever win a race and I'm very thankful that I had the opportunity to achieve one. I'm looking forward to the second season of SOC!